Dice games for kids blend fun and learning. Skills like matching, sorting and critical thinking can be taught through board games. Kids have so much fun playing that they don't even notice that they're getting smarter. Let's call it stealth education. The games for kids on this page include custom dice, cards, boards and other fun tools of the gaming trade. Let's take a look at each one to see what makes them so much fun. These dice games for kids provide great social interaction. Dice board games help kids develop social skills like patience, sharing, communication while having fun. The DICECAPADES: Word Pirates! game encourages kids (6 years and older) to spell words in order to build bridges, block other and players and win the treasure. 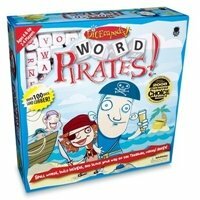 With a 100 letter dice, a piratey game board and other gaming goodies, this game sparks the imagination and sends kids on a pirate spelling adventure. Here's one of the great dice games for kids (5 years old and older) that features matching objects or pictures. Based on bingo,Dog Dice includes 2 custom dice and 4 bingo boards. Roll the dice, find the dog that matches the roll and mark off that square with a "bone marker" on your board. Fill your board first and win! In the interest of pet fairness, we can't have a dog dice game without including a cat dice game too! 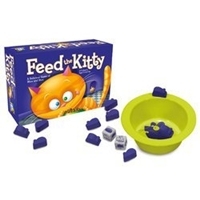 Feed the Kitty dice game uses fun custom dice to help 20 wooden mice avoid the kitty's food bowl. The last player with mice wins! Ideal for kids 5 and older, Animal Yahtzee provides a refreshing spin on the classic dice game. Instead of traditional numbered dice, this is one of several dice games for kids that include custom dice. You score points by rolling dice with pictures of monkeys, camels and tigers in this fast and fun dice game for kids. This game delivers a visually appealing way for kids to learn the math skills of counting and sorting. With gold coins, custom dice and ruby red rhino figurine, the stage is set for a fun adventure. To lift the Curse of the Ruby Rhino, a player must capture -- and hang on to -- the Rhino by itself. The 7 dwarfs are up for grabs in this creative spin on the story of Snow White and the Seven Dwarfs. In the Dwarfs dice game roll the custom die and take a dwarf that matches the color from the center or from an opponent's hand. Watch out for the witch! If she turns up on a die roll, all players must return a dwarf to the center. Once all the dwarfs have been removed from the center, the game is over and the player with the most dwarfs wins! Doodle Dice teaches matching skills to kids 6 and older. Players roll the custom dice to create a doodle. Then, they look through the deck of cards to see if there's a matching card. If they find a match, the player keeps the card. Collect one card of each color to win Doodle Dice! A fun game for young children based on the nursery rhyme. 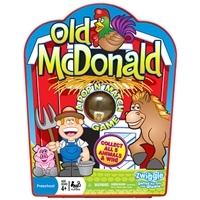 The Old McDonald Preschool Game doesn't require reading. The dice are contained inside a pop-o-matic bubble so players push down on the bubble to roll. The goal is to fill in your game card with the animal pictured on the dice. The first one to fill their card wins. 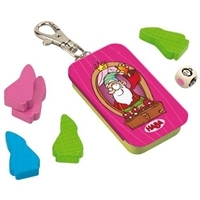 This dice game for kids is ideal for travel as it has a built in carrying case and the dice cannot be lost thanks to the bubble. A fun, educational twist on the classic Shut the Box dice game, 4-Way Countdown encourages kids to practice their math skills to win. When you can learn and play at the same time, that's the best of both worlds. Looking for fast, fun, silly dice games for kids? You and your kids will enjoy Say Cheese! You roll the dice and try to grab the cards that match your roll. Pick up the most matching pairs and win! Please subscribe to this page (use orange button on left) and you'll be automatically updated on new additions to dice games for kids.